The Social Media Marketing & Content Creation Workshop, which we hosted last week in partnership with Women of Today by Camila Alves McConaughey, exceeded our expectations in every way. We want to thank all our amazing attendees, our brilliant panelists, and our generous sponsors for contributing food and beverages for the event and goodies for our guests to take home. We’ll be talking about some of the details in upcoming posts, but we thought we’d share a brief recap of this inspiring two-day event. The media dinner we held the night before the workshop received a write-up on People.com, so be sure to check out that article for a rundown of all the famous faces in attendance—including singer-songwriter Andy Grammer, Fixer Upper craftsman Clint Harp and his wife Kelly, television host Rocsi Diaz, Houston-based design and lifestyle bloggers Ashley Rose and Jared Smith of Sugar & Cloth, model Nicole Trunfio, and Queen Sugar actress Marycarmen Lopez. The evening began with cocktails created by liquid chef Rob Floyd of Bar Rescue. Rob takes holistic approach to cocktails, viewing a beverage as an experience and focusing on fresh, natural, and health-forward ingredients. Rob wants his recipes to be accessible and engaging, so he didn’t hesitate to bring our guests behind the bar for a little hands-on training. He showed us how to create a Smoking Gun, a unique take on an Old Fashioned that involves lighting a sprig of rosemary on fire! Guests who chose not to drink alcohol sipped on sparkling water from Dripping Springs, TX bottler Richards Rainwater. While Rob entertained guests in the No. 1450 kitchen, our Boho cottage was abuzz with activity. 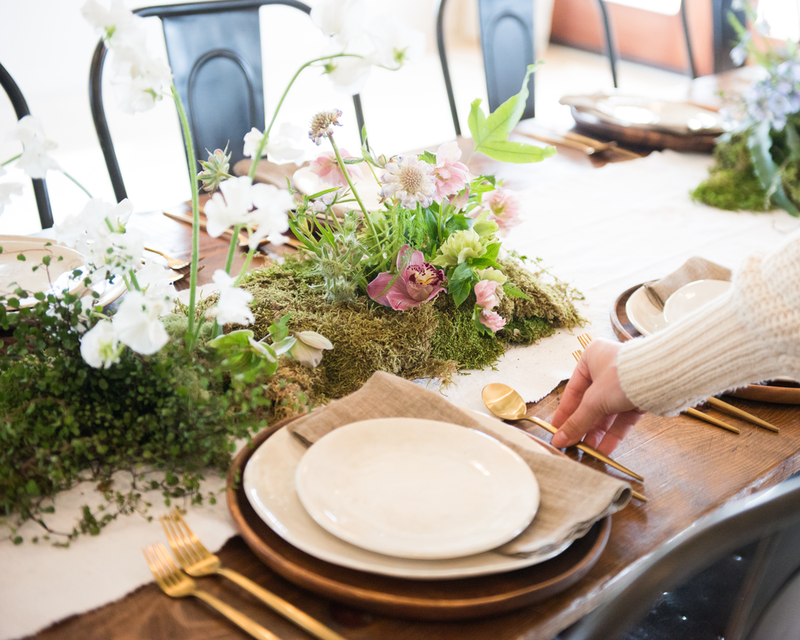 The team at Loot Rentals was hard at work setting up a 28-foot-long banquet table for 30 guests, and created a place setting that beautifully complemented the botanicals that we collaborated on with Camila and floral design studio Davy Gray. In the kitchen, Arlo Grey owner and Top Chef winner Kristen Kish and her team prepared a meal of salmon crudo, spring salad with beets and haricots verts, and fresh pasta. Once the sun went down, guests dined by candlelight, passing along family-style dishes and sipping rosé, Chenin blanc, and Tempranillo from local Texas wineries C.L. Butaud and Infinite Monkey Theorem. Chef Kish served a sublimely light and fresh strawberry meringue for dessert, which was followed by another round of sweet treats in the No. 1450 cottage—Brazilian brigadeiros from Austin-based Rio Bites and chocolaty dessert cocktails created by Rob Floyd. To conclude the evening, guests were treated to an acoustic performance from Andy Grammer, who played a few of his hit songs, including “Fine by Me” and “Keep Your Head Up.” With guests sitting on Loot’s floor poufs and low-slung lounge seating, Andy shared some of the personal stories behind his music, making this a truly special and intimate live -music experience. Want to learn more behind-the-scenes details from the Women of Today x The Vintage Round Top media dinner and workshop? We’ll be spotlighting a few of our amazing collaborators in the next few blog posts—and sharing some of their recipes and entertaining tips!—so make sure to check back for more! Special thanks to sponsors Campari, C.L. Butaud, Infinite Monkey Theorem, Loot Rentals, and Loot Finer Goods, Richards Rainwater, Rio Bites, Sugar & Cloth; and guest contributors Rob Floyd, Andy Grammer, Kristen Kish, and Valerie Wolf.